At Ella Mentry School, all the grownups are quite weird in their own weird way. And things have gotten weirder! From a principal who kisses pigs to a teacher who wears dresses made of pot holders, A.J. and the gang from Ella Mentry School have had some weird and wacky adventures. 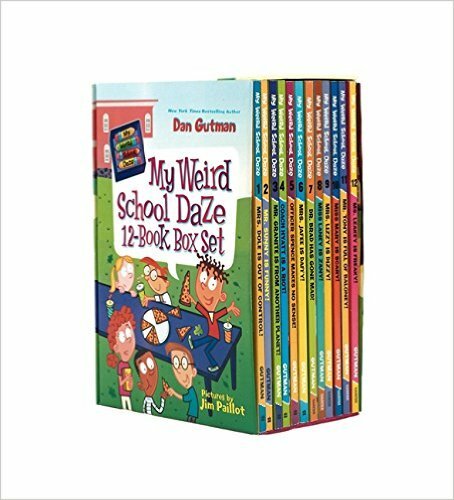 I discovered these books about a year ago when I was looking for a first set of chapter books for my seven-year old. The first one we read was Dr. Nicholas is Ridiculous and he was instantly hooked. We have since read every single book, and thank goodness new ones release every few months, because he misses them like crazy when we don’t have new ones to read. 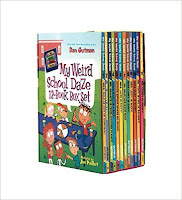 There are nearly a hundred books broken down into four series: My Weird School, My Weird School Daze, My Weirder School, and a set of holiday books. The series is about the many adventures of A.J. and Andrea, arch enemies at Ella Mentary school. They have some wacky teachers and an even wackier bald principal. The stories are farfetched, but absolutely hilarious.